Salmon is one of the most popular choices in the fine restaurants of the world when it comes to fish. And it’s no surprise that it’s also the favorite fish on American dinner plates. But did you know that you are much better off eating the wild-caught version as compared with those that are raised on fish farms? Wild-caught salmon is one of those “super green” seafoods that comes from the least-pressured habitats, is free of industrial pollutants such as dioxin and mercury and also contain the highest levels of healthy omega-3 fatty acids. It used to be that it was hard to find wild-caught salmon in supermarket, but that has changed the past few years. Major chains such as Target have abandoned farm-raised salmon, and many local grocery stores have followed suit. At our friendly neighborhood, both kinds of salmon are available, but it’s the healthier wild-caught variety that we purchase. 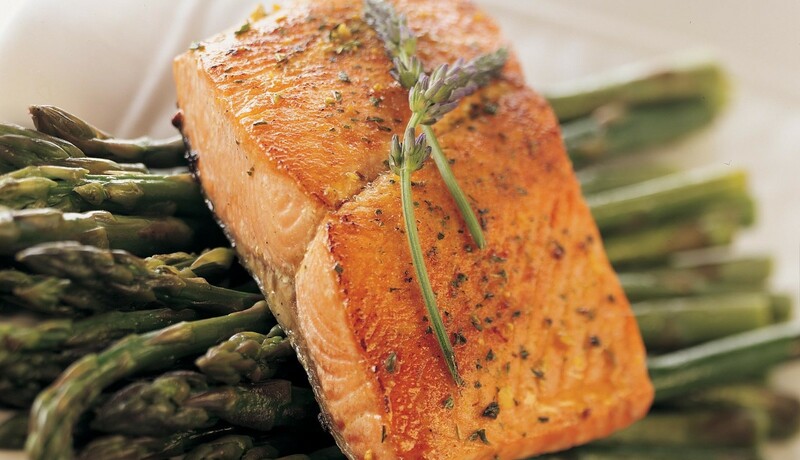 One of the best deals is the two-fillet packages of frozen salmon that is perfect for Therese and me, especially when combined with a tasty vegetable such as asparagus and maybe a baked potato and salad. Here’s my favorite salmon recipe. The fillets are baked in the oven in a light sauce made up of white wine, lemon juice and olive oil and seasoned with shallots, garlic, dill, salt, pepper and McCormick Salmon Grill Mates Seasoning. It’s also sweetened a bit of brown sugar. Place salmon and wine, lemon juice and oil olive in Dutch oven. Sprinkle on shallots, garlic and dill. Season with salt, pepper and salmon seasoning and then brown sugar. Bake in oven preheated to 350 degrees for 45 minutes to 1 hour. Serve with vegetable such as asparagus and baked potato.